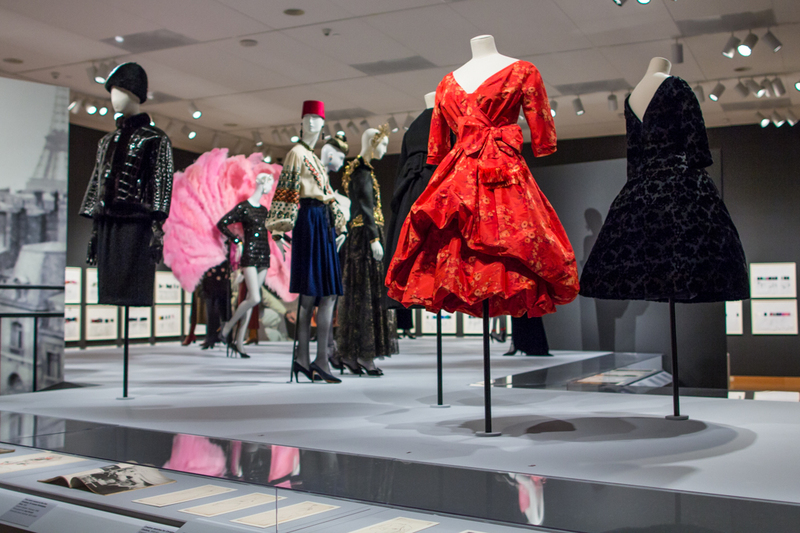 The design and installion of the Yves Saint Laurent: The Perfection of Style exhibition was a large undertaking and involved constructing elaborate stages and catwalks. The galleries are completely transformed to create an experience unique to the art of fashion. By building out into the galleries to execute this design, our capacity is limited. If you’re purchasing tickets online or in person and notice that we are selling timed tickets, this exhibition layout is the reason why. Each section of the exhibition approaches a different era or design technique used by Yves Saint Laurent. Take a quick walk through it with us! Beginning with the Winter 1955 collection, Dior, the world’s most celebrated couturier, began to include his young assistant’s designs in the collections. A black dress draped with a white scarf caused a sensation when it appeared in the now-iconic photograph by Richard Avedon, Dovima with Elephants. In 1962, Yves Saint Laurent and Pierre Bergé co-founded the haute couture house at 30 bis rue Spontini in Paris. From that moment, the collections drew their inspiration from street life and pop culture. Saint Laurent proclaimed, “You no longer need to be rich to have style.” In 1966, Saint Laurent and Bergé launched the SAINT LAURENT rive gauche label. A pioneer in luxury ready-to-wear, the brand succeeded beyond their wildest expectations, enjoying worldwide acclaim. The shy young man in the black tie had evolved into a long-haired beatnik couturier. He exemplified the synchronicity between appearance and lifestyle. From the 1980s until the maison de couture’s closing, every move by the couturier contributed to the creation of his mythic persona. The first such event was the large retrospective exhibition in 1983 at the Metropolitan Museum of Art in New York. Curated by Diana Vreeland, it celebrated twenty-five years of creations. 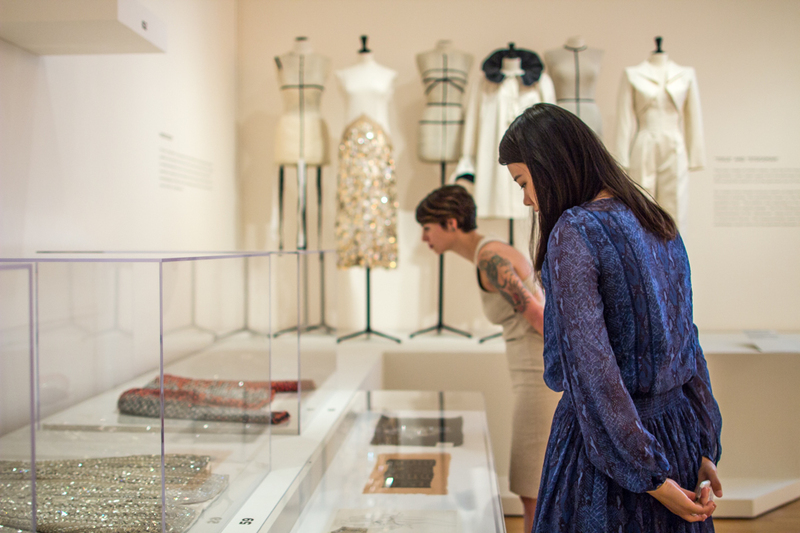 It was the first time that a living couturier was the subject of a museum show. Saint Laurent was only forty-seven years old. Another global milestone was reached in 1992, this time in Seville, where Saint Laurent’s iconic styles were shown in a fashion retrospective at Expo 92. The play between masculine and feminine is seen in Saint Laurent garments that borrow from menswear: the Winter 1963 motorcycle jacket, the Winter 1967 pantsuit inspired by film noir gangsters, the trench coat drawn from British World War I officers, and the jumpsuit, the uniform of aviators. The exploration of fashion that transcends gender culminated in the redesign of the safari jacket, inspired by big game hunters of France’s colonial past. In an emblematic photograph from 1969, Saint Laurent and Betty Catroux stand together, wearing nearly identical safari jackets that express their own new gender. Worn with thigh-high boots, Betty Catroux exemplifies rock and roll while Yves adopts an androgynous pose. Saint Laurent proposed that men concede part of their virility to women and that women accept men’s feminine side. The production of an haute couture garment was a complex process that began with a sketch. Saint Laurent’s drawings included specifics about ergonomics, “drape” and the equilibrium that must be maintained between the fabric and the body. He would then meet with his chefs d’ateliers (workshop heads) to give them his drawings to be translated onto a toile, the preliminary garment made of white cotton. The toile was then fitted on the mannequin cabine (fitting model) and presented to Saint Laurent. Once Saint Laurent had approved the toile after three or four fittings, it was time to choose the fabrics, colors and adornments, such as exclusively-made buttons. Then the toile was laid flat to create the paper pattern that would be used to cut the fabric. If the fabric was to be embroidered, the motif was either drawn in pencil or a paper cutout of the motif was applied to the toile. Sometimes the process was simplified, by draping the fabric directly onto the model’s body. Saint Laurent declared, “I can’t make any decisions without them.” The models were, he said, his “reality.” Finally, a few days before the fashion show, in the large Second Empire style salon, Saint Laurent would choose among the many accessories displayed on trays and other embellishments. 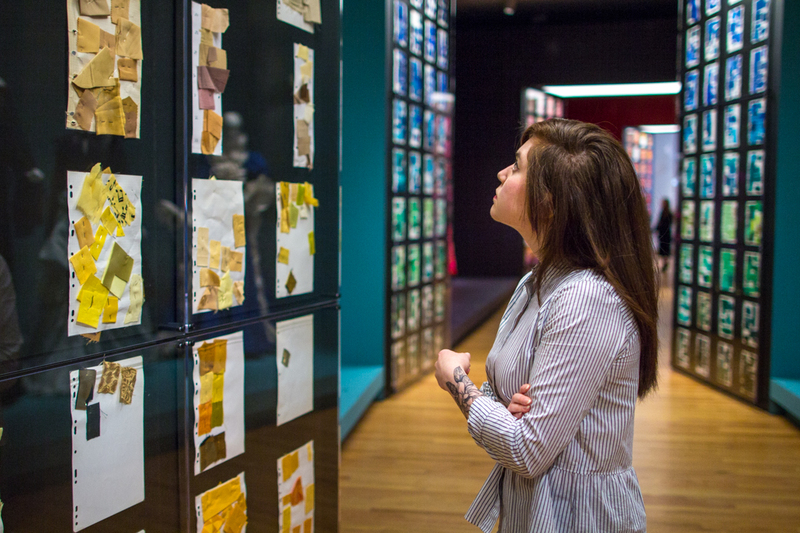 The next galleries conduct you through a large selection of pages of échantillons de tissu—fabric samples that he used as a reference to his preferred hues, including his favorites, pink and blue. Near these pages, color-coordinated gowns from forty years of his career display key elements of the Saint Laurent style. The young Saint Laurent used a rather dark color palette. When he discovered Morocco in 1966 he was shocked by the intensity of the blue sky, the beauty of the Majorelle Garden which Pierre Bergé and he saved from destruction and bought in 1980, and the varied hues of traditional garments worn in the medina. In addition, his admiration for the paintings of Henri Matisse helped Saint Laurent to expand his palette into an explosion of intense colors that would become a strong element of his style going forward. From black, which he considered a real color, to the exploration of this colorful palette, Saint Laurent’s sensitivity to color is noticeable in every aspect of his style. 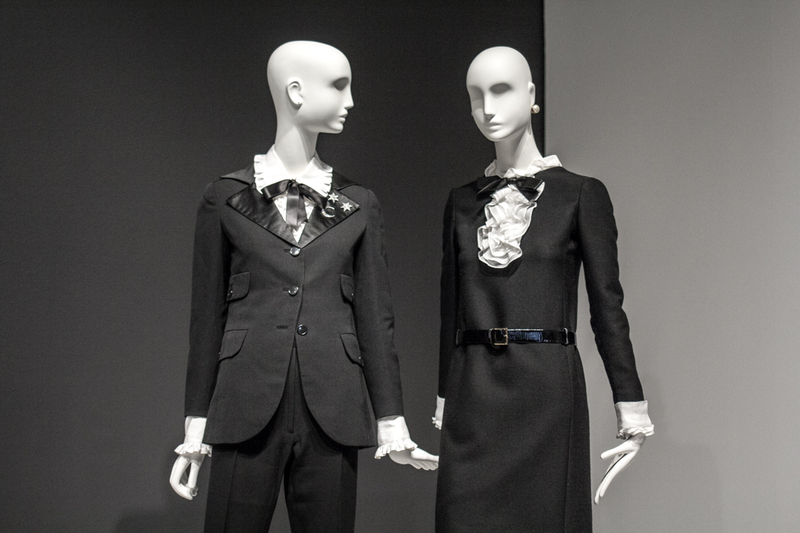 Images: Installation views of Yves Saint Laurent: The Perfection of Style at Seattle Art Museum, Photos: Natali Wiseman.